Herein lies possibly one of the most remembered, at least in part, chapters of The Fellowship of the Ring. The council of Elrond and deciding the fate of the ring. The council itself is full of familiar faces from this book and from The Hobbit. I do have to thank Steve Jackson for one thing here though, this is the first time I've actually noticed Thranduil. In my defense, I'm really bad at names. Like I have to make a concerted effort to keep Les Paul and Les Claypool straight (as for Ice Cube and Ice T, I feel like if I ever get to meet one of them I should apologize). As for non-familiar faces, we have someone from the Grey Havens. That's... a pretty damn big deal. The council itself is very timely met, no one was summoned due to the Ring's presence, or even necessarily it's approach. Again, coincidence is always an option, but I'm holding to my previously stated theory that there is an agent acting in opposition to Sauron. The coincidences in this story however are a bit beyond ordinary happenstance. Boromir traveled almost three months to get a dream interpreted. So not just a dream of what is to come, but a dream that directly relates to the very gathering we are now present for. A large part of this council is news of the world at large and answering questions about activities previous unknown. The biggest trend is the growing shadow of Sauron over the lands. Kingdoms of men and dwarf alike have been approached by his agents, seeking "friendship" and hobbits, offering rings of power in return. The extended history of the Ring starts with the elves, and a friendship with Moria before Sauron revealed his true nature. The elves are so often presented as infallible, but Sauron gained the knowledge to make the One ring directly from them. The only reason that the Three elven rings are untainted is they too were made in secret and hidden from Sauron's power (for now). Elrond is relating much of the history as a primary source. He was there for the war, and when Isildur took the ring for himself instead of throwing it into the fires of Orodruin, also known as Mount Doom. Knowing what I do of the story to come, I wonder what would have happened had Faramir had made the journey instead of Boromir. Would they have met the same fate? The dream only came to Boromir once, after many appearances to Faramir. Boromir is both prideful and earnest, truly wanting the best for his people, but pursuing paths with perhaps the "impatience" characteristic to the short-lived race of man. Foolish, yes, for thinking to stand against the ring's corruption, but he has not the frame of reference that the elves and wizards possess. If any man present should know of the true nature of the Rangers, Boromir should be it, yet until enlightened he looks down on Aragorn. I absolutely love that Tolkien treats us to Bilbo's sass. "Not very good perhaps, but to the point - if you need more beyond the word of Elrond. If that was worth a journey of a hundred and ten days to here, you had best listen to it." His time recuperating has served him quite well. Gandalf's tale is perhaps the darkest part yet, minus him fulfilling his trickster nature by making off with Rohan's best horse. 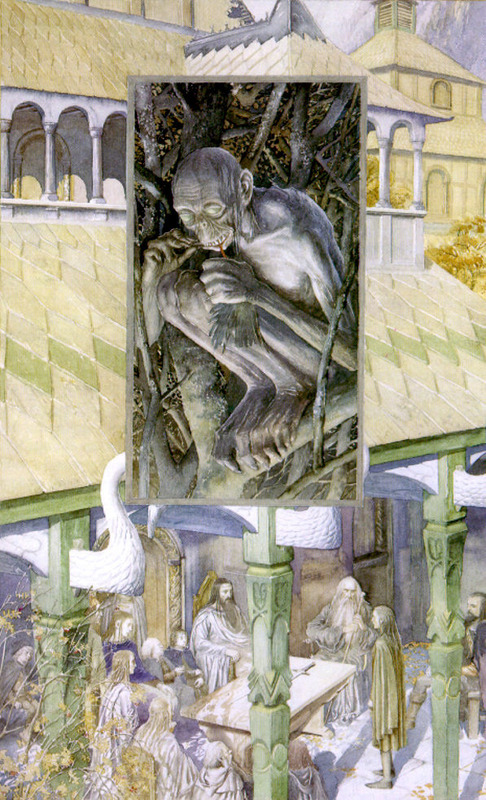 It provides proof of malfeasance by Saruman, connects the different elements of the stories so far, and explains how Gandalf escaped his incarceration. Part of all of this is the role and fate of Gollum, tracked down by Aragorn, questioned by Gandalf, left in the hands of the wood elves, and now escaped as relayed by Legolas. Learned from all of this is that Sauron knows Gollum's tale, the re-discovery of the ring and of hobbits. As for the confrontation with Saruman, it's worth noting that he's not actually lying. A dark power is rising, an age is ending, and the elves' power is waning. His arrogance and condescension in something else all together. As Gandalf points out, the Ring can only have one master. As the foremost scholar of Sauron and the Ring it strikes me as particularly arrogant and self-defeating to seek to embrace the ring for himself since he would know better than any of the bond between the Ring and Sauron. At this time, he's seeking his own power, "Saruman mustering a great force on his own acount, in rivalry of Sauron and not in his service yet." I find it interesting how much the council dances around the solution. Early on we learn the only way to truly end the threat of Sauron is the destruction of the Ring. Yet that is the last solution that the council discusses. I can think of several reasons, including the reluctance to destroy something of such value and power. The elves stand the most to lose, a likely diminishing of their Three great rings of power. But the Ring is present, and it wouldn't be beyond it's power to subtly influence those present. It does definitely effect Frodo, with a sudden disgust and reluctance when called on to display the Ring. And as is true to Samwise's nature, he was listening in this whole time (certainly not the first time he's done so), and steadfastly pledges to remain at Frodo's side. Taking a look at the film, we've been seeing Gandalf's difficulties all along, minus Radagast's unwitting role in Saruman's deception. Jackson has Saruman as an agent of Sauron all a long, rather than in opposition. With the exclusion of Radagast, Gandalf summons his rescue with the aid of a passing moth, rather than the beasts acting on their own initiative. I'm generally a fan of how these segments were done, and it helps minimize the amount of dialog needed for the Council. We actually do get Gandalf's journey into the Necromancer's lair, or at least an interpretation of it, in The Hobbit. Jackson does give us some extra flavor here; conversation between Gandalf and Elrond that otherwise replace the need for exposition, the arrival of council members, the importance of specific individuals, foreshadowing of the weakness yet to be revealed, and further building principle relationships. Honestly, the time is generally well used. Arwen's choice is momentous, but one of a magnitude that loses some of it's weight without the extensive history and elven legend that appears in the book. Largely the love story between Arwen and Aragorn does not come into play at this point, but I think it makes sense to start establishing it here rather than "oh hey, that pretty elf lady is now your queen" at the end. The council here is specifically about the Ring, rather than a meeting of individuals all answering different needs and calls. The ring is even brought out from the start, and everyone hears its whispering call. The politics are bared down to short and to the point, with Boromir is already being painted as prideful, impetuous, and desiring of power. But everyone is quick to anger here, arguing instead over who will complete the necessary task rather than skirting around what must be done. On a personal note, I'll admit to beingsomeone who found Aragorn super hot when the movies first came out (my weakness for men with long hair?). Watching it now... I almost wish that the casting for Aragorn and Boromir were switched. I think Sean Bean would have made for an excellent Aragorn... and to me he has the better voice. In comparison, Viggo's voice comes out a bit too thing and nasal.